In a bid to improve the guest experience, low-cost airline AirAsia has recently unveiled an improved website and mobile app as well as a chatbot powered by artificial intelligence. AirAsia officials introduce AVA, an AI chatbot designed to respond to guest inquiries instantly. The updates are designed to deliver a more seamless, user-friendly experience to airasia.com and the app’s 3.3 million monthly active users. “We are excited to welcome the new year with our new-look website and app that features AI and boasts a better, faster, more intuitive experience. We are always working to enhance our guest experience, and we will be adding more mobile app features in the months to come so it is no longer just a flight booking platform, but your complete travel companion,” enthused AirAsia deputy group chief executive officer Aireen Omar. AVA, or AirAsia Virtual Allstar, is an AI chatbot available on the new live chat feature made to respond to guest inquiries instantly. It currently speaks eight languages, including English, Bahasa Malaysia, Thai, Bahasa Indonesia, Vietnamese, Korean, Simplified Chinese, and Traditional Chinese. Meanwhile, the new homepage is designed for easier and faster navigation, including upcoming flight notice; search shortcut and recent searches; links to the best hotels, travel, duty-free shopping, and activity deals; recommended destinations; and link to BigPay, AirAsia’s money app. A first among online apps, iOS users can now choose where to go using an interactive map that pinpoints all AirAsia’s destinations in a single page, they can also select the nearest departure and arrival airports, and check their upcoming flight status by asking Siri. 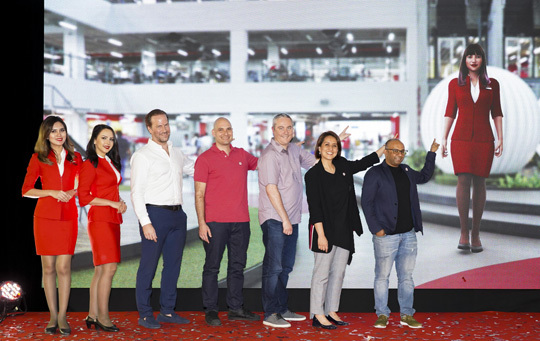 Guest may now enroll to AirAsia’s Fast Airport Clearance Experience System on their mobile app to clear security and board their flight seamlessly. Finally, guests can search for the lowest fares using the Low Fare Calendar, which has been integrated into the app.